What Is Your Fall 2014 Color Palette? | Oh Sarah O ! Autumn is officially here, which means it's time to swap out my summer shorts, t-shirts, and sandals for long pants, sweaters, and boots. Before determining which pieces to store and which pieces to keep, I decided to create another color palette like I did for the Spring/Summer season, because I found it very helpful in detouring my impulse purchases. First I made a color palette based on what colors I currently have in my closet. 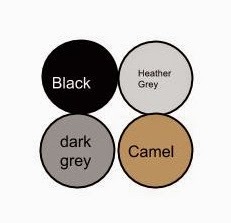 Then I selected a few colors from my palette that resonated with Fall/Winter and divided them into three categories (neutrals, near neutrals and statement colors). Have you created a Fall/Winter color palette? What colors are you favoring this season? Let me know in the comments below.